To make Rose’s Jessie the Cowgirl Shirt, I started with a plain white longsleeved shirt with a collar. Jessie has some yellow paneling on the front and some big cuffs, so I thought it should be pretty easy to mod a thrift store find. I sketched the shapes for the yellow fabric onto a paper grocery bag, and cut out the material. I thought I was going to do fringe on her sleeves, (the white fabric above) but it just didn’t look quite right and also had the potential to be a pain in the neck, so I decided to skip it. 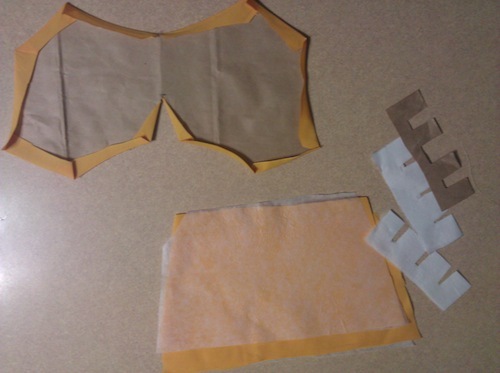 I also cut out some interfacing so that the cuffs would stand up a little more and look cartoony. 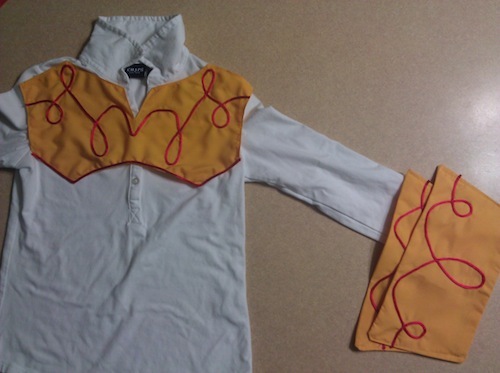 Then I stitched on some red cord resembling the pattern from her costume in the movie. I freehanded it, so it isn’t perfect. And I bought three yards of cord (usually I am a chronic overbuyer, and have two giant bins of fabric from other projects in my basement, which enabled me to only spend the four bucks on the cord to make this shirt) which was only barely enough. I would have liked to have a little more for the cuffs, but as I usually craft well after the fabric store closes for the night, I didn’t want to break my momentum so just used what I had. We ordered the hat from the Disney store. Rose is going to look awesome. 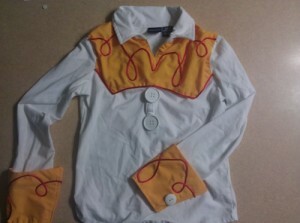 I am so excited for this set of costumes, since we will have Woody, Jessie, Buzz, Sid, The Prospector, Ken & Barbie, Zurg, Mr. Potato Head, a Pizza Planet Alien, and the Pizza Planet Delivery guy. Should be pretty epic. Now I just have to work on Rose’s Harry Potter robe for when we visit the Wizarding World of Harry Potter. She wants a quiddich robe, even though Hermione never played quiddich and Hermione is her favorite character in the book. But I made one for Dillon last year, and so I could probably muddle through again. Should have blogged it better, or at least kept some notes, but I’ll figure it out. This entry was posted on Friday, October 12th, 2012 at 8:42 pm and is filed under meaningful labor. You can follow any responses to this entry through the RSS 2.0 feed. You can leave a response, or trackback from your own site. Unsinkable by Themebuilder | Entries (RSS) and Comments (RSS).